When you think of wedding furniture, your backside might begin to ache a bit in anticipation of folding metal chairs dressed up in awkward decorative slip covers. 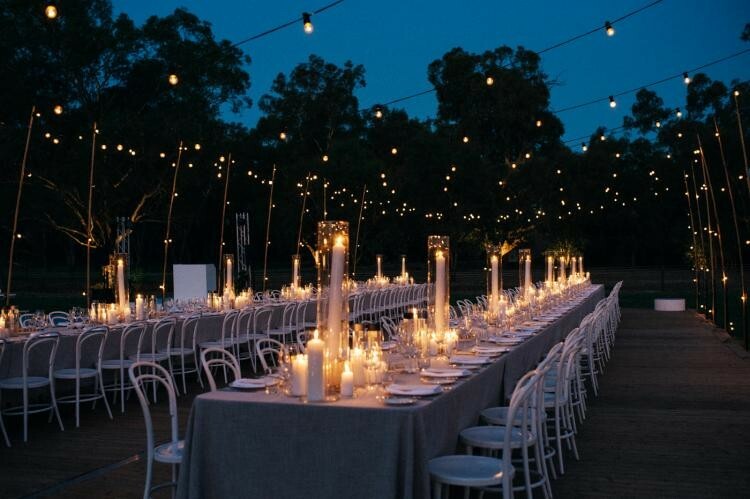 Here are ideas on how to transform your Melbourne wedding with rented wedding furniture. Why not add some class (and save your…bottom) by renting quality furniture for your Melbourne wedding? Wedding rentals go far beyond lattice archways, chocolate fountains, and cake tables. Here are some ideas to personalise your wedding design, create cosy spaces within your venue, and keep your guests comfortable and happy. Verification that you are permitted to bring outside furniture, equipment, and decorations to the site (and be sure they list any exclusions). A rough map of indoor and outdoor areas, including measurements (you may need to supply these yourself). Contact the references, and after asking about their overall experience with the venue, be sure to ask their opinion of the furnishings provided. Were the tables rickety? Upholstery stained? Did the outdoor furniture look like it had barely survived a nuclear blast? Do you have a wedding planner? She may have some excellent referrals to wedding furniture rental firms or even her own stash of wedding furniture and fixtures. Once you have a guest list, you can begin drafting your ceremony and reception seating charts. Even if you aren’t assigning guests to tables, you’ll want to make sure they can navigate safely and easily through the dining area. If your venue doesn’t have enough dining tables, and fire codes permit more, you’ll want to reserve rentals well in advance of your wedding day. Consider renting chair cushions and stylish, secure slip covers to hide unsightly seats. Are you holding your ceremony outdoors? Be sure to rent wedding tents large enough to give cover to your entire guest list if indoor alternatives aren’t available. Sprawling venues with indoor and outdoor areas are often devoid of comfortable, relatively quiet places to sit and visit. A few sofas facing one another or in “L” shapes with low tables within reach invite conversation and connection. These are wonderful for patios and sprawling lawns, and hard-of-hearing guests will appreciate the chance to interact without missing out. Consider renting attractive, portable gazebos to shade your guests, and if it’s allowed, set up a sheltered spot away from indoor entrances and main areas for smokers. Rent a portable fire pit or two and surround them with comfortable outdoor furniture (don’t forget blankets) for post-sunset snuggles! If you’re throwing a kid-friendly wedding, consider renting furniture or equipment suitable for small bodies. Set up a play area, and check with out-of-town guests to find out if you need to rent cribs, playpens, or auto safety seats for their children to use at their hotels, in their auto rentals, or during your event. If you have enough space, you might even consider an inflatable “bounce house”. Who knows? Your grandfather might even jump in and knock loose his grouchy attitude! Booking furniture and bringing games and toys are only two ways to keep your guests’ kids happy and entertained. Hiring a qualified, vetted nanny is another. Confer with families on your guest list to find out what you can do to make their experience more enjoyable. Don’t let your guests skulk amid a sea of white, crumb-covered table rounds when you can bring them together in a more comfortable, inclusive way. When it’s time to strike up the wedding band, set a few sofas, padded benches, and overstuffed chairs just beyond the edges of the dance floor to allow guests to rest in between sets, or for your more senior loved ones to be part of the fun. Draping companies often send workers out to hang swags of fabric from beams, hide unsightly walls with curtains on portable framework, and assist with hanging string lights or paper lanterns. Many companies offer discount services in which you rent and set up draping yourself. Ask if they have lighting for rent; you can drape translucent textiles over strings of faery lights for a warm, cosy effect. Creative use of furniture, decorations, lighting, and portable structures can transform a drab venue into a dreamscape. Ambient music, the laughter of delighted guests, and the squeals of playful (and occupied!) children are the details that make a wedding memorable.